Esther Gokhale is the creator of the Gokhale Method, a pain-reduction program based on postural corrections and healthy, natural movement that incorporates optimal postural habits. She has been teaching posture, dance and yoga and practicing acupuncture for many years. Gokhale teaches the Gokhale Method at her wellness center in Palo Alto and now has teachers throughout the world that are qualified in the method. Gokhale herself continues to travel, teaching the Gokhale Method at corporations such as Facebook and Google, giving lectures to physicians’ groups, and consulting with sports teams. 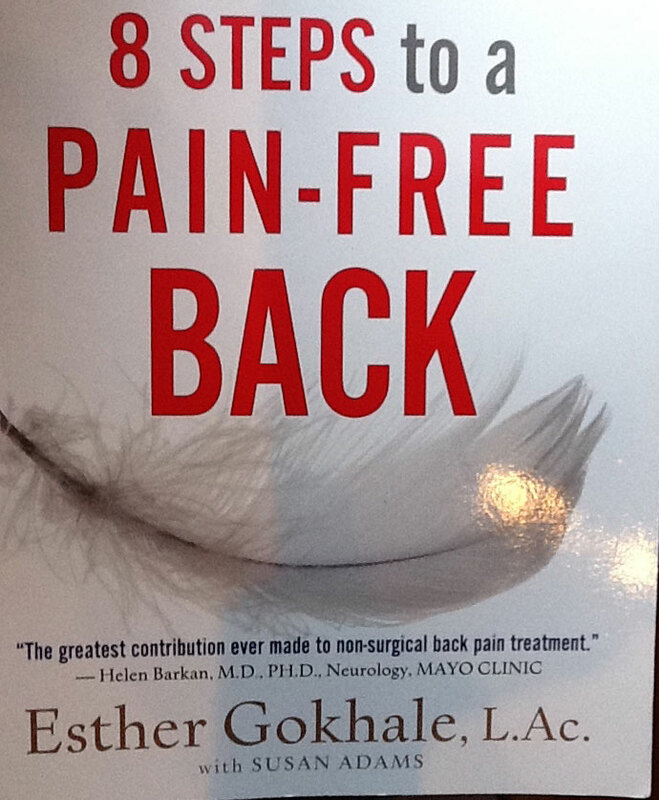 8 Steps to a Pain-Free Back has been translated into multiple languages. Gokhale’s television program, Back Pain and the Primal Posture Solution, is available on dvd. Gokhale’s work is based on the premise that, despite the marvelous design of the human body, modern Western civilization perpetuates postural habits and activities that inevitably lead to back and other pain. Gokhale’s journey began following an unsuccessful post-pregnancy back surgery to correct a painful disc herniation. Gokhale was determined to avoid a second surgery recommended by her doctors. She studied and became certified in Aplomb Training at the Institut d’Aplomb in Paris, France, which dramatically reduced her back pain and enabled her to avoid surgery. The Aplomb Technique is an “anthropologically based posture modification technique” developed by Noelle Perez. Gokhale pursued further study at Stanford University Medical School and the Stanford Department of Anthropology. She honed what later became the Gokhale Method following visits to many countries in Europe, Asia, Africa and South America. During these visits, Gokhale studied, observed, interviewed, and photographed many people who, despite days filled with strenuous labor and long periods of sitting or bending, never suffered from back pain. The book includes many photos from Gokhale’s travels. The book additionally includes quite a few pictures of babies. Gokhale, like Joseph Pilates, believes that babies begin life with good posture and rapidly learn bad habits. Gokhale’s work is based on the premise that, despite the marvelous design of the human body, modern Western civilization perpetuates postural habits and activities that inevitably lead to back and other pain. Contrary to the non-Western cultures that Gokhale studied, Westerners no longer understand what it means to have good posture. Most people thrust their pelvises forward, which leads to slouching, rounded shoulders, forward head, and consequently, pain. Because they do not know what good posture looks like, their attempts to correct their posture are wholly unsuccessful. Gokhale suggests that Westerners lost sight of what constitutes good posture somewhere around the turn of the century. This view certainly coincides with that of Joseph Pilates who in wrote in 1945 that “our bodies are slumped, our shoulders are stooped, our eyes are hollow, our muscles are flabby (…). This is but the natural result of not having uniformly developed all the muscles of our spine, trunk, arms and legs in the course of pursuing our daily labors and office activities. ”(Return to Life Through Contrology- Editor’s note – reviewed in The Book Review and Discussion Club Forum by Elaine Ewing, although I am assuming that everyone has read the book. J.
Interestingly, and there has been some debate on this recently, Gokhale joins biomechanist Katy Bowman (Alignment Matters, Move Your DNA -Editor’s note-: both of which have been reviewed by The Book Review and Discussion Club Forum) and Jonathon Fitzgordon (Corewalking, Psoas Release Party) who very vehemently insist that a tucked pelvis is the most prevalent postural deviation today. (Others argue that hyperlordosis is more common). Gokhale goes further to claim that the ideal spine is not the S shape with gentle curves in the lumbar, thoracic and cervical spine that is typically shown in modern anatomy books, but rather a J-shaped spine with an anteverted pelvis and a fairly pronounced lumbar-sacral arch followed by a mostly straight spine (remember that Joseph Pilates also touted a straight spine, although not an anteverted pelvis). The spines depicted in modern anatomy books or spines with hyperlordosis have a lumbar arch that is higher and not confined to the lumbar-sacral region. Gokhale substantiates her theory with a drawing from an anatomy book published in 1911 as well as with photos of primarily non-Westerners (although a few of the “good posture” photos depict people in the US) she observed during her studies and travels (many from Brazil and Burkina Faso) and also with images of ancient Greek and Egyptian statues. Although many Greek statutes do seem to have rounded upper back, Gokhale claims that this rounded shape is the result of pronounced upper body musculature that hides the straight spines of the models. In the chapter on hip-hinging, Gokhale clearly states that bending the back is bad, stretching and damaging ligaments and leading to disc damage and pain. The book devotes a chapter to each of the steps of Gokhale’s eight step-program. The lessons include: stretch sitting, stretch-lying on the back, stack-sitting , stretch-lying on the side , using one’s inner corset, tall-standing and hip-hinging. Each lesson contains several instructional photos and brief written instructions as well as photos of people of all ages who display the optimal posture that Gokhale describes. Gokhale includes some photos of people with poor posture, typically modern Westerners. The book additionally includes quite a few pictures of babies. Gokhale, like Joseph Pilates, believes that babies begin life with good posture and rapidly learn bad habits. She also believes that the way non-eastern mothers carry their babies encourages their babies’ bodies to develop good posture. The lesson on tall-standing includes some instruction with respect to the feet. The author claims that feet should have a kidney shape and be very slightly turned-out, similarly to what many Pilates practitioners refer to as “Pilates stance”. Here, she differs from Katy Bowman who writes in Alignment Matters that the feet should be parallel. In the chapter on hip-hinging, Gokhale clearly states that bending the back is bad, stretching and damaging ligaments and leading to disc damage and pain. She does not encourage bending the knees except in certain situations, such as lifting heavy loads. Rather, Gokhale stresses that healthy bending involves hinging at the hip (also a subject of (sometimes heated) debate within the movement method communities, including the pilates community– see also Jon Hawkin’s review of Stuart McGill’s Low Back Disorders). Working with a good Pilates instructor would, in my opinion, be much more effective than following the Gokhale program because a thorough Pilates program should also teach students how to apply what they have learned to all of their activities, both inside and outside a Pilates studio. 8 Steps is interesting reading and Gokhale’s program has without a doubt helped countless people. Most of the “exercises” offered within the book are not really exercises per se, although the appendix does offer some optional exercises that seem to be drawn from yoga, as well as some that strongly resemble pre-Pilates. Working with a good Pilates instructor would, in my opinion, be much more effective than following the Gokhale program because a thorough Pilates program should also teach students how to apply what they have learned to all of their activities, both inside and outside a Pilates studio. The book would, however, be a great gift to give to your mother-in-law who is resistant to all your attempts to teach her Pilates or to anyone you know who is irrevocably allergic to exercise in any form. The accuracy of Gokhale’s theory about the J-shaped spine is debatable. Certainly the spines shown in the photographs that fill the book seem to support the theory, but Gokhale presents no medical images in the book beyond the anatomy book drawings (although she may well present such images elsewhere). It would be interesting to see this theory developed further.